With the “surgical strikes” of 2016, the months-long standoff with the Chinese Army in Doklam in 2017 and, most strikingly, the air attack on a Jaish-e-Mohammad camp in Pakistan last month, Narendra Modi’s India has decisively signalled the importance of force in protecting its interests. The key unknown now is whether the country’s military capabilities match this intent. Now that the dust seems to be settling on Balakot, it is time for a singularly uncomfortable question: Why is it that, militarily, the aerial engagement of February 27th ended in a stalemate? The prevalent lay narrative in India always has been that of a manifestly weaker Pakistan which would face certain rout in event of any kinetic engagement. That proposition stands challenged after the events of last month. To be fair, precise relationships between capabilities and combat outcomes are murky. That said, dominant military capabilities are a necessary — though by no means sufficient — condition for victory in war. And at the heart of the issue of military capabilities lies the question of financial allocations for defence, not just how much to spend but what to spend on (Graph 1). In a democracy, how a government allocates resources for various national priorities — across and within different expenditure heads — is a political statement in itself. At the risk of mixing macro- and micro-economics, budgets are revealed preferences: given a country’s (projected) fiscal capacity any year, one can potentially construct an infinite number of them; a government’s choice of one over the other reveals what it deems important, politically viable and expedient. This is where comparing budgets across different governments — as we have done here over 20 years, from NDA-I to UPA-I and II and, finally, on to NDA-II — becomes illustrative, to highlight contrasts. But comparing budgets across years also reveals continuity and “stickiness” (to appropriate another term from microeconomics): persistent priorities, bureaucratic inertia, and presence of holy cows that governments of varying political persuasions take as givens. Absent a formal national security strategy — which India lacks — that tethers defence budgets to the evolving threat environment, these ‘stickinesses’ persist, unchallenged. In the last 20 years, one such pattern has been the dominance of revenue over capital expenditure allocations — or to put it more bluntly, the preponderance of unproductive military allocations on salaries and such over productive ones as new weapons and platforms (Graph 9). 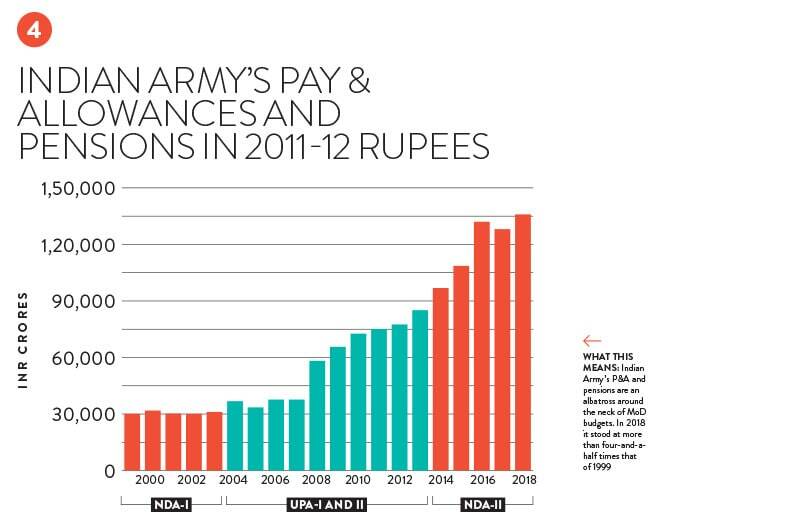 Specifically, the Indian Army’s pay and allowances and pensions now threaten to overwhelm the total Ministry of Defence (MoD) allocations (Graph 4). Last year, the Indian Army’s uniformed manpower strength stood at close to an astonishing 13 lakh soldiers. A product of disputed land borders as well as an intractable insurgency in Kashmir, through its sheer numbers the army has in recent years emerged as a political actor. 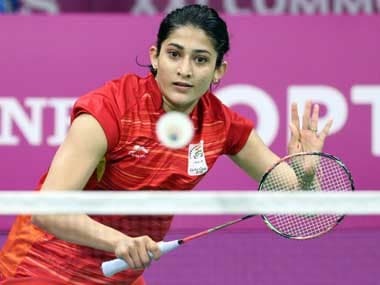 First breaking into the scene with the One Rank-One Pension (OROP) agitation in the run-up to the general elections of 2014, with the appointment of General VK Singh — whose public skirmishes with the UPA-II government marked a new low in civil-military relations in the country — as a junior minister, the Modi government’s tacit alliance with this powerful constituency seemed complete. Matters weren’t really helped when the government started meddling in army promotions, appointing Lt General Bipin Rawat as chief out of turn. If the army preferred the BJP-led government (which recklessly promised to implement OROP as part of its 2014 campaign), Modi’s preference for Rawat over Lt Generals Praveen Bakshi and PM Hariz squared the circle on army politicisation. But there is a deeper reason why the Modi government has been reluctant to take on the army — and why right-sizing it may prove to be impossible for any government in the future. It has to do with changing character of the Indian Army itself, with increased representation in its rank and file of electorally important states like Uttar Pradesh. Yale professor Steven Wilkinson, in his seminal 2015 study of the Indian military, noted that Uttar Pradesh provides 13 per cent of the Indian Army strength (2009 data). While a positive development in many ways — this corrects a historical over-representation of certain states like Punjab in the army — the rise of electorally key states such as UP as main hiring pools for the army also implies that any attempt to freeze recruitment will be politically very expensive there. This is more so the case for the BJP. 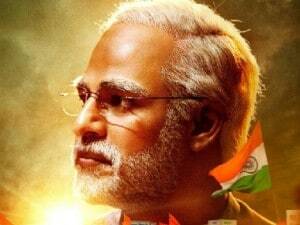 To wit, Modi cannot simultaneously project himself as a pro-military candidate in election rallies, say in UP, as well as embark on trimming the fat that threatens to choke the arteries of the Indian military apparatus, should he come back. And therein lies the fundamental paradox at the heart of Indian politics, when it comes to defence reforms: the only way any prime minister can really overturn the military is by not playing up his or her pro-military credentials for electoral purposes. For once you have done so, your hands become tied in terms of any dramatic reforms that you may see the necessity of introducing in the future. If electoral compulsions are one obstacle in reforming the Indian Army, Kashmir is the other. 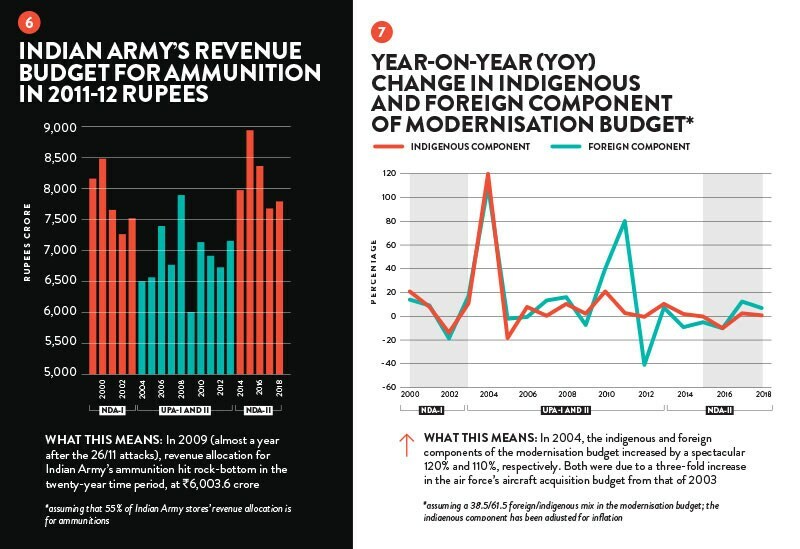 Counter-insurgency functions in that state continues to bleed the military and sap its limited resources (Graph 10). But the army has also cynically continued to tag a “half front” along with drumming up the traditionally nightmarish joint (“two-front”) threat from China and Pakistan — and by doing so protecting the lion’s share of budgetary allocations that it has become so used to since Independence. Privately, senior army officers now talk of a ‘strategic’ role for the counter-insurgency (COIN) centred Rashtriya Rifles, meaning that they are now a frontline conventional force against Pakistan. Under Rawat, this blurring of COIN and conventional military operations got etched into the army’s doctrine and provide further justification for maintaining its current manpower strength. 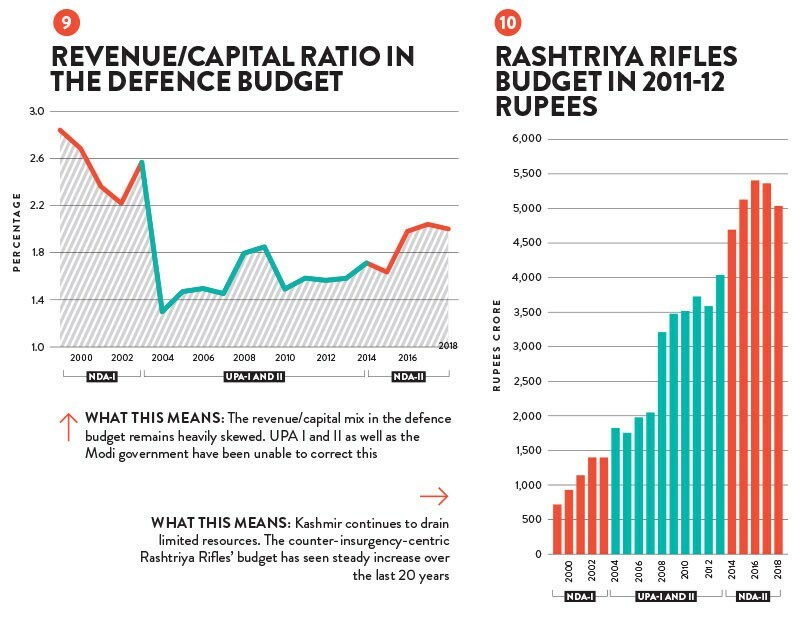 Ironically, revenue allocations for the army’s ammunition purchases have wildly gyrated in the past 20 years (Graph 6). Successive governments have failed to realise that armies are as good — and as safe — as the firepower at their disposal. To further see this predilection for man over machine, compare the Indian Army’s pensions to what the Indian Air Force is allocated for purchasing new weapons and platforms (Graph 2). As videos of Wing Commander Abhinandan Varthaman — pilot of an aging MiG-21 tasked with repelling superior F-16s — in Pakistani custody circulated over social media, the political class would have done itself a favour by asking: Should creature comforts of retired faujis matter roughly three times more than that of the safety of young pilots at the frontline of the nation’s defence? 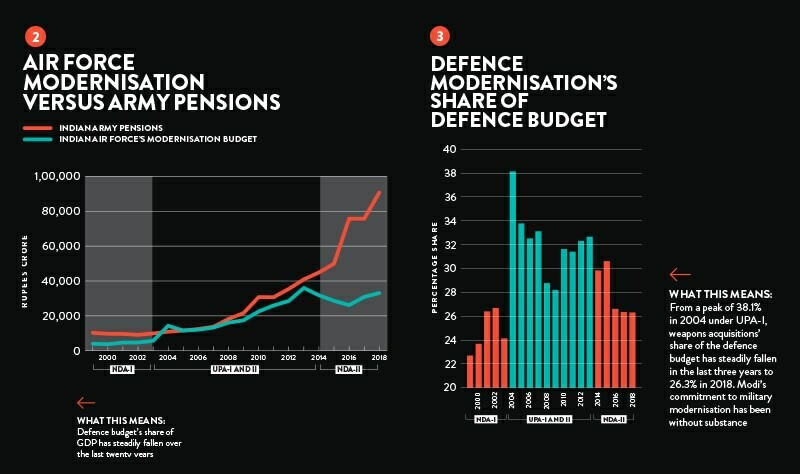 A related point is the dwindling share of military modernisation in the defence budget. Last year, the money allocated to buying new weapons for the three services stood at a little more than a quarter of the defence budget. And this is where Modi – compared to Vajpayee– has performed abysmally (Graph 3). 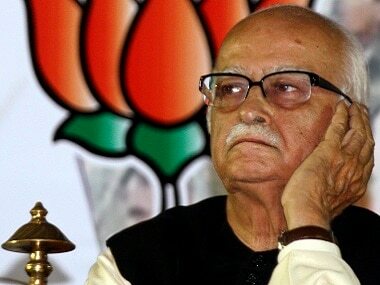 While he has continued to play up his image as a man for the military — especially on the post-Balakot campaign trail – the statistical record shows that beyond rhetoric and theatrics, his commitment to military modernisation has been middling, gratingly contrasted to the UPA governments (Graph 7). But then again, people vote, weapons don’t. 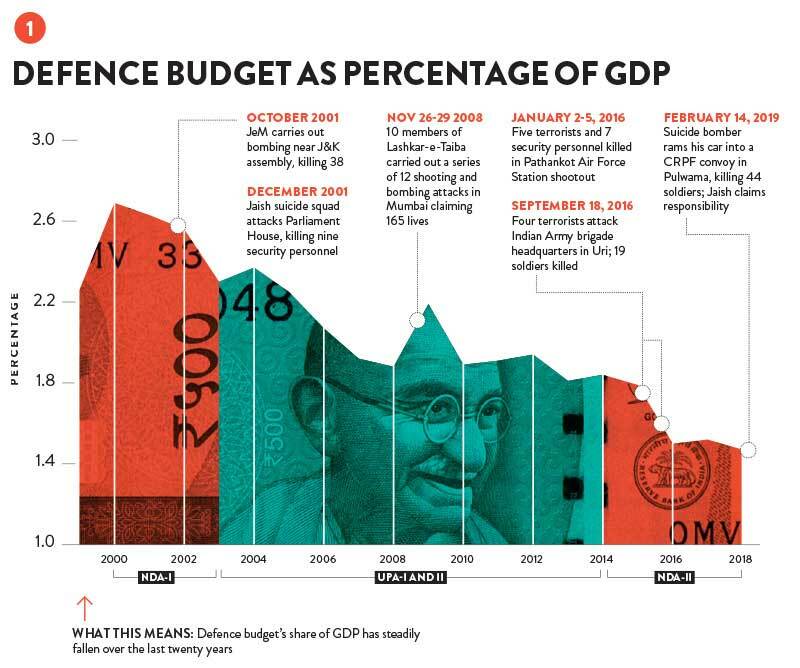 In a country where defence policy remains, in the words of Brown professor Ashutosh Varshney, “elite politics,” rhetoric around muscle electorally matters more than substantial course corrections in the defence budget — something very few outside Delhi care about. Lack of interest in defence policy among the political class has also implied that white elephants like the Defence Research and Development Organisation (DRDO), mandated with developing indigenous defence solutions, continue to command resources and consistently disappoint at the same time. As an example, witness the DRDO’s Sisyphean quest to produce a main battle tank (Arjun) that would be unambiguously acceptable to the army (Graph 5). In a political system where defence policy is benignly neglected, the penalties for non-delivery from stakeholders are minimal. 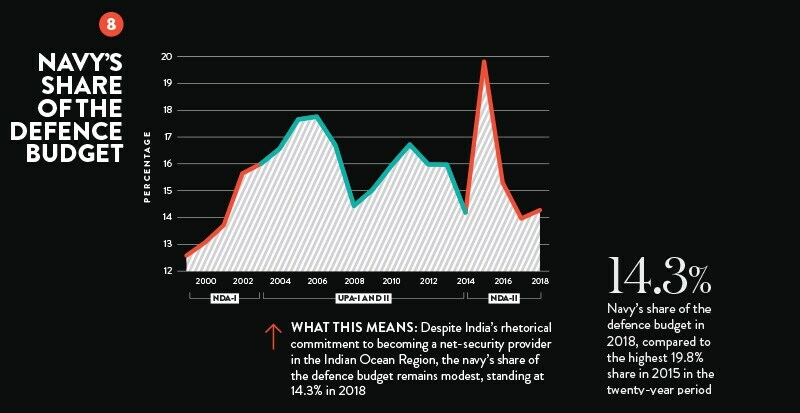 The land-centric orientation of the Indian military — equally due to persistent threats as well as domestic politics, as discussed above — has had a deleterious impact on the navy, whose share of the defence budget remains the smallest. Despite early efforts by the Modi government to correct this situation, the capital-intensive navy remains neglected (Graph 8). 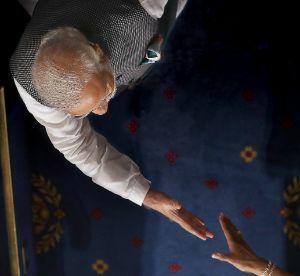 Again, Modi’s rhetoric around the Indo-Pacific — and India as the “heart and head” of the Indian Ocean region, as the 2017 Joint Doctrine of the Indian Armed Forces put it — rings hollow considering extant budgetary priorities. Modi may have promised making India a “leading power,” not realising that no modern state has ever become so militarily without becoming a significant naval power. And this is not a matter of aspiration alone. As China continues to intrude into the Indian Ocean, India’s institutional neglect of the navy will prove very expensive in the future. Sixty years ago, American nuclear strategist Bernard Brodie quipped that “strategy wears a dollar sign” — something that India is yet to understand and internalise. While South Block continues to wax eloquent about its plans to raise India’s international profile as well as keep Pakistan (and in sotto voce, China) in check, they forget that India’s path to power runs through the North Block, home to the Ministry of Finance. If governments continue to misspend on defence — hobbled as it has been by multiple constraints as well as neglect — and yet signal muscular foreign policies, the gap between intent and capability will continue to widen, till the day of reckoning when it may be too late. And this is where Modi’s legacy will prove problematic. Had he toned down his rhetoric around the military and gotten to the business of actually reforming it instead, India would have been far better off in the long run. Drawing on the massive political capital he enjoys, Modi ought to have put hard cash behind his words.